One thing that’s particularly driving me crazy at the moment is the inconsistent and contradictory names for Chinese pluck styles. Some experts use “mao jian” to refer to anything bud-and-one-leaf set and “mao feng” as bud-and-two-leaf set. Yet, when it comes to a tea like “Huang Shan Mao Feng”, mao feng means “fur peak” and specifically refers to a place. In that case, it’s a bud-and-one-leaf set anyway. *shakes head* I obviously need to give this issue further research. Fortunately it’s clear that titles ending in “Ya” always mean exclusively or almost exclusively bud only. Bud only tends to be the best anyway: such is the case today. Since ordering this tea, I’ve noticed that Upton actually updated the spelling of the tea style on their site, so i have no qualms about referring to it now with the more accurate spelling Huo Shan Huang Ya (Yellow Sprouting). This austere Yellow tea from Anhui is basket-fried and then given the men huan “yellow sealing” treatment. In appearance, Huo Shan Huang Ya is a twisted-needle bud-and-one-leaf set. Sadly, my review doesn’t resemble Upton’s description for Huo Shan Huang Ya whatsoever. Sometimes that happens. Tea is afterall, an art. In aroma Huo Shan Huang Ya has a delightful sweet grassy or herbaceous note similar to an expensive shade-grown Gyokuro. 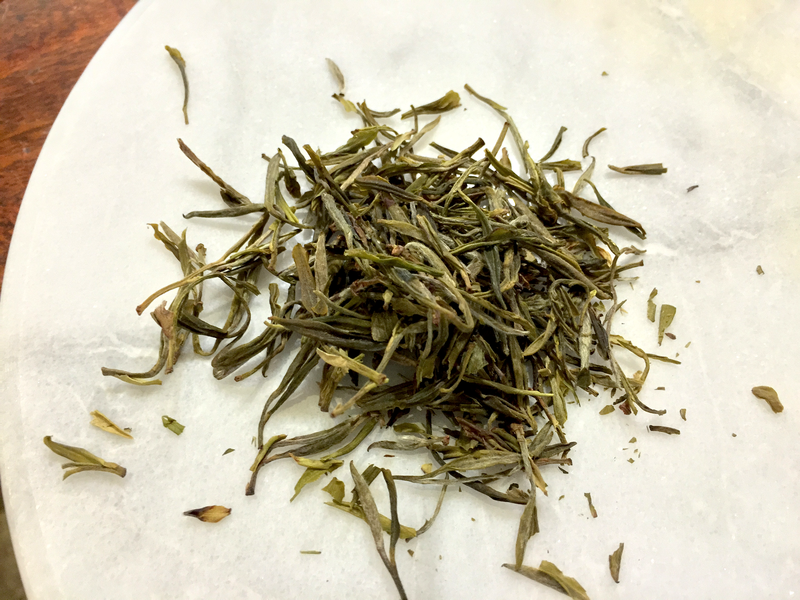 Huo Shan Huang Ya’s flavor is a wake up call: the bud-and-one-leaf set pluck helps gives this Yellow a calming medium-high astringency. The closest flavor I could point to with Huo Shan Huang Ya is waxy green beans, but even that is dulled by its Yellow Tippy bright sweet note. Although this tea was brewed in reverse osmosis water, the tea seems to alter the water, endowing it with a higher “mountain river minerals” content (i’m sure i’m just imagining things)? In texture, Huo Shan Huang Ya is incredibly smooth and calm, almost like drinking pure water. One thing i particularly likely about Huo Shan Huang Ya is the explosive chlorophyllic aroma of its spent tea. Just a delight to steep. I am so glad the West has finally been introduced to a few good Yellow teas. Huo Shan Huang Ya is no exception. Huo Shan Huang Ya (Upton): loose leaf by Jocilyn Mors is licensed under a Creative Commons Attribution-ShareAlike 4.0 International License. Huo Shan Huang Ya (Upton): spent by Jocilyn Mors is licensed under a Creative Commons Attribution-ShareAlike 4.0 International License. Huo Shan Huang Ya (Upton): liquor by Jocilyn Mors is licensed under a Creative Commons Attribution-ShareAlike 4.0 International License.